At the end of 2016, the American Joint Committee on Cancer (AJCC) Cancer Staging Manual (8th edition) was published. The anatomic and prognostic stage groups were defined in the section on breast cancer. In the prognostic stage group, the stages were identified by using T, N, and M, as well as ER, PR, HER2, and tumor-grade biomarkers. In addition, patients in T1-2, N0, M0, grades 1-3 and those with ER (+), HER2 (-), and Oncotype DX recurrence score <11 were classified as stage IA. A year later, in the light of new data, the breast cancer section of the AJCC manual (8th edition) was updated. This review aims to reveal the changes in the stages of our institutional breast cancer patients according to the first and updated versions of the AJCC manual (8th edition) and to compare the clinical reflections with the help of staging studies with regard to the manual. According to the pathological prognostic stage data, patients mostly display downstaging. The first TNM system for breast cancer was developed in 1959. There was limited information available regarding the biology of breast cancer at that time, and there was no effective systemic treatment available. Today, parameters such as the tumor grade, estrogen receptor (ER), progesterone receptor (PR), and HER2 status are known to have predictive and prognostic importance. At the end of 2016, the American Joint Committee on Cancer (AJCC) Cancer Staging Manual (8th edition) was published. Anatomic and prognostic stage groups were defined in the section on breast cancer. In the prognostic stage group, the stages were identified by using T, N, and M, as well as ER, PR, HER2, and tumor-grade biomarkers. In addition, patients in T1-2, N0, M0, and grades 1-3 and those with ER (+), HER2 (-), and Oncotype DX recurrence score <11 were classified in stage IA. A year later, in the light of new data, the section on breast cancer in this manual was updated. Although the basic principles did not change, stages involving clinical and pathological prognoses were added in addition to the anatomic stage. There were no changes in the anatomic stage for breast cancer in the first and the updated manuals. This review aims to reveal the changes in the stages of our institutional breast cancer patients according to the first and the updated versions of the AJCC manuals and to compare the clinical reflections with the help of stage studies involving the updated manual. Here, 353 patients with stages I-III breast cancer who underwent surgery as the primary treatment at the Istanbul University, Institute of Oncology between 2004 and 2006 were considered. Data involving T, N, M, ER, PR, HER2, and tumor grade were noted in accordance with the section on breast cancer of the AJCC manual (8th edition). The histological grade of the tumor was evaluated according to the Elston-Ellis modification of the Scarff-Bloom-Richardson grading system. The ER biomarkers were determined by immunohistochemistry and were recorded as the percentage of cells stained as positive. The cut-off of 1% was used for the treated patients, which was consistent with the changes in the American Society of Clinical Oncology (ASCO) guidelines. The PR status was determined by immunohistochemistry, and staining of 1% of the cells or more was considered to be positive for PR. HER2 status was defined as positive if the score was 3+ on immunohistochemistry or fluorescence in situ hybridization, demonstrating gene amplification. Because the anatomic stage did not change in the first and the updated versions of the AJCC manuals, all the patients were staged according to the anatomic stage, prognostic stage as per the first version, and pathological prognostic stage as per the updated version. Stage changes (unchanged, upstaged, and downstaged) were detected. The 21-gene Oncotype DX (Genomic Health, Inc.) breast recurrence score contains both prognostic and pathological prognostic staging systems. Oncotype DX assay was not performed in this series. However, the potential effect of the Oncotype DX multigene assay was examined according to the first and the updated versions. The median age was 48 years (24-79 years). Tumor grade was grade 1 in 19 patients (5.4%), grade 2 in 154 patients (43.6%), and grade 3 in 180 patients (51%). In addition, 253 (71.7%) patients were detected as having ER (+); 265 patients (75.1%), PR (+); and 64 patients (18.1%), HER2 (+). The anatomic, prognostic, and pathological prognostic stage results are listed in Table 1. One of the most remarkable points is that in the first version of the manual, 50 (14.2%) patients had no prognostic stage; however, in the updated version, all the patients had a pathological prognostic stage. The other point is that in the first and the updated versions, the patients were downstaged as compared to the anatomic staging system. However, downstaging was more prominent in the updated version than that in the first version. The degrees of stage migration are listed in Table 2. Oncotype DX multigene analysis was appropriate in 97 patients (27.5%). Oncotype DX assay was not performed in this series. Regardless of the Oncotype DX recurrence score, out of the 97 patients, 46 (47.4%) would still be in stage IA in the first version and 83 (85.6%) would still be in stage IA in the updated version (Table 3). After the publication of this update, the prognostic stage was validated in additional cohorts. [7-13] The anatomic and prognostic stage analyses of the updated manual in breast cancer subgroups was performed on five of these studies [8-10,13] and the general group involving non-metastatic invasive breast cancer patients was analyzed on three of them. [7,11,12] Hu et al. investigated the stage changes according to the anatomic and prognostic stage systems in the AJCC manual (8th edition). Weiss et al. reported that patients with unknown prognostic stages were not included in the survival analysis, although no number of patients were specified in the literature. Lee et al. reported that there were 497 patients (6.7%) who did not have prognostic stage outputs while having anatomical stage outputs. Hu et al. reported that there were 77 patients (9.8%) who did not have prognostic stage outputs. The prognostic stages of 50 (14.2%) patients could not be determined in our institutional series. In December 2017, the section on breast cancer of the AJCC manual (8th edition) was updated in the light of new data. Two analyses were performed on the NCDB data. In the first case, the clinical information of all the patients who showed the clinical prognostic stage was used. In that study, 334.000 patients who were diagnosed with invasive breast cancer between 2010 and 2012 and the median follow-up period of 41.7 months were evaluated. All the patients were included in this analysis, regardless of the treatment, because most of them received systemic treatment on the basis of their stages and biomarkers. The clinical prognostic stage was recommended for all the patients. The second analysis was limited to the patients with surgical resections as the initial treatment. Patients who received preoperative systemic therapy or radiotherapy (neoadjuvant therapy) were excluded from this analysis; all the remaining patients were included, regardless of the treatment received by them after surgery. Approximately 306.000 patients whose median follow-up period was 42.3 months and diagnosed between 2010 and 2012 were included in this analysis. Pathological prognostic staging should be calculated in patients undergoing surgery as the initial treatment. Pathological prognostic stage groups were established by combining the anatomic stage groups with the grade, ER, PR, and HER2 statuses. Here, 120 different patient categories were revealed in this way. In the first version as well as in the updated version of the AJCC manual (8th edition), patients in T1- 2, N0, M0, grades 1-3 and those with ER (+), HER 2(-), and Oncotype DX recurrence score <11 were classified as stage IA. In almost all the studies, Oncotype DX multigene assay results were reported as "does not exist." In our institutional series, there were 97 (27.5%) patients appropriate for Oncotype DX determination. If the Oncotype DX recurrence score of all the patients was <11, all of them would be identified as stage IA. If it was ≤11, 46 (47.4%) out of the 97 patients would be in stage IA, according to the first version; similarly, the remaining 30 (30.9%) patients would be in stage IB; 16 (16.5%) patients, stage IIA; 1 patient, stage IIB; and 1 patient, stage IIIA. Further, 3 patients with no prognostic stage would not have been able to undergo staging. If this value was ≤11, 83 (85.6%) out of the 97 patients would be in stage IA according to the first version; similarly, the remaining 12 (12.4%) patients would be in stage IB, and 2 (2.1%) patients, stage IIA. In the pathological prognostic staging group, the number of stage IA patients increased to 38.2%. Although it is necessary to validate these results with further studies in the future, the number of patients who should be examined with Oncotype DX test according to pathological prognostic staging seems to have decreased. By analyzing the anatomic and prognostic stages according to the first version of the AJCC manual (8th edition), Hu et al. reported that the patient distribution rate was as follows: 24% patients in stage IA; 31%, stage IIA; 20%, stage IIB; 13%, stage IIIA; 0.9%, stage IIIB; and 8.5%, stage IIIC. In our study, the anatomic stage distribution was similar: 27.8% of them were in stage IA; 28%, stage IIA; 20.1%, stage IIB; 15%, stage IIIA; 0.8%, stage IIIB; and 7.6%, stage IIIC. The prognostic stage distribution was examined according to the first version. Hu et al. reported that the distribution was 15.9% in stage IA; 27%, stage IB; 6.9%, stage IIA; 11.6%, stage IIB; 10.5%, stage IIIA; 8.5%, stage IIIB; 7.1%, stage IIIC; and 9.8%, unknown stage. While in our study, these values are 14.4% in stage IA; 19.5%, stage IB; 13.6%, stage IIA; 7.1%, stage IIB; 7.1%, stage IIIA; 13%, stage IIIB; and 14.2%, unknown stage. Considering pathological prognostic staging (updated version of the AJCC manual), there was an increase of 8.7% and 22.1% in stage IA, 21.2% and 2.3% in stage IB, 13% decrease and 1.4% increase in stage IIA, 9.3% decrease and 3.7% increase in stage IIB, 6.2% decrease and 1.7% increase in stage IIIA, 3% increase and 9.2% decrease in stage IIIB, and 5.3% decrease and 8.7% decrease in stage IIIC according to the anatomical staging and first version of AJCC manual (8th edition), respectively. In particular, according to the anatomic stage, an increase in stage IB was detected, whereas an increase in stage IA was also detected according to the first version of the AJCC manual (8th edition). In our institutional series, it is revealed that downstaging increases in relation to the pathological prognostic staging system. In patients who require Oncotype DX multigene analysis, it can be emphasized that it would still be stage IA at the rate of 85.6%, independent of the Oncotype DX multigene score. In the treatment of breast cancer, tumor biomarkers have been taken into consideration for decades and they facilitate the determination of the way of treatment. Breast cancer staging is no longer limited to anatomical findings, but it can be associated with the tumor grade, ER, PR, and HER2 statuses. The rapid change in the staging systems in the last year seems to lead us to patient-oriented treatments for breast cancer in the future. According to the pathological prognostic stage data, patients mostly display downstaging. Results from further studies may reveal whether a particular patient group may require Oncotype DX shrink or not, and how to use the information from other multigene analyses (MammaPrint, Prosigna, Breast Cancer Index, EndoPredict, etc.) 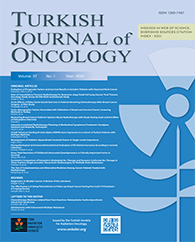 in clinical decision-making in breast cancer patients. Conflict of Interest: The author declares no conflicts of interest. Financial Support: No financial support was used for the study. 1) Hortobagyi GN, Connolly JL, D"Orsi CJ, Edge SB, Mittendorf EA, Rugo HS, et al. Breast. In: Amin MB, editor. AJCC Cancer Staging Manual. 8th ed. New York: Springer International Publishing; 2016. 2) AJCC: American Joint Commitee on Cancer. Updated Breast Chapter for 8th Edition Available at: https:// cancerstaging.org/references-tools/deskreferences/ Pages/Breast-Cancer-Staging.aspx Accessed March 15, 2018. 3) Elston CW, Ellis IO. Pathological prognostic factors in breast cancer. I. The value of histological grade in breast cancer: experience from a large study with longterm follow-up. Histopathology 2002;41(3A):154-61. 4) Hammond ME, Hayes DF, Dowset M, Allred DC, Hagerty KL, Badve S, et al. American Society of Clinical Oncology/College of American Pathologists guideline recommendations for immunohistochemical testing of estrogen and progesterone receptors in breast cancer. J Clin Oncol 2010;28(16):2784-95. 5) Wolff AC, Hammond ME, Hicks DG, Dowset M, McShane LM, Allison KH, et al: American Society of Clinical Oncology; College of American Pathologists. Recommendations for human epidermal growth factor receptor 2 testing in breast cancer: American Society of Clinical Oncology/College of American Pathologists clinical practice guideline update. J Clin Oncol 2013;31(31):3997-4013. 6) Winchester DJ, Edge SB, Giuliano AE. Important 8th edition changes for the AJCC breast cancerstaging system. Ann Surg Oncol 2017;24:S61. 7) Weiss A, Chavez-MacGregor M, Lichtensztajn DY, Yi M, Tadros A, Hortobagyi GN, et al. Validation study of the American Joint Committee on Cancer eighth edition prognostic stage compared with the anatomic stage in breast cancer. JAMA Oncol 2018;4(2):203-9. 8) Xu L, Li JH, Ye JM, Duan XN, Cheng YJ, Xin L, et al. A retrospective survival analysis of anatomic and prognostic stage group based on the American Joint Committee on Cancer 8th edition cancer staging manual in luminal B human epidermal growth factor receptor 2-negative breast cancer. Chin Med J (Engl) 2017;130(16):1945-52. 9) Ye J, Wang W, Xu L, Duan X, Cheng Y, Xin L, et al. A retrospective prognostic evaluation analysis using the 8th edition of American Joint Committee on Cancer (AJCC) cancer staging system for luminal A breast cancer. Chin J Cancer Res. 2017;29(4):351-60. 10) Wang M, Chen H, Wu K, Ding A, Zhang M, Zhang P. Evaluation of the prognostic stage in the 8th edition of the American Joint Committee on Cancer in locally advanced breast cancer: An analysis based on SEER 18 database. Breast. 2018;37:56-63. 11) Lee SB, Shon G, Kim J, Chung IY, Lee JW, Kim HJ, et al. A retrospective prognostic evaluation analysis using the 8th edition of the American Joint Committee on Cancer staging for breast cancer. Breast Cancer Res Treat 2018;169(2):257-66. 12) Abdel-Rahman O. Validation of the 8th AJCC prognostic staging system for breast cancer in a population- based setting. Breast Cancer Res Treat 2018;168(1):269-75. 13) Zhou B, Xu L, Ye J, Xin L, Duan X, Liu Y. The prognostic value of the 8th edition of the American Joint Committee on Cancer (AJCC) staging system in HER2-enriched subtype breast cancer, a retrospective analysis. Anticancer Res 2017;37(8):4615-21. 14) Hu H, Wei W, Yi X, Xin L, Liu Y. A retrospective analysis of clinical utility of AJCC 8th edition cancer staging system for breast cancer. World J Oncol 2017;8(3):71-5.